So Bug called me at work in tears. She had lost the handspun citron shawl which I knit her last year for her birthday while she was at school. This, to her, was a disaster because we were leaving the next day for vacation and she couldn’t figure out how to go without one. This was a true knitting emergency. I promised her a new shawl in her choice of yarn and yes it could contain both pink and purple. She chose Noro. That’s my girl! And this picture is how far along I was in the St. Louis airport during our flight east. But that isn’t the end of the knitting emergency, for once I got to my destination, I broke my needles! The emergency had an emergency which will require a trip to the lys tomorrow morning. Stay tuned for more emergency shawl travels! Camera is packed away and I am about to embark on a wonderful trip. I am sure I’ll take pics and post them once I get there. Have a great week everyone! And she doesn’t even write about knitting. She is capable of knitting, but to my knowledge isn’t doing so. But you really must check her out, because she is one of the people I miss the most now that she has moved from our area. Talking to her in person was often like watching a stand up comedy routine, I would expect her blog to be similar. Check out our dear friend Kristen at Jesus and Potatoes. I finished the icord forever during a card game on Saturday night. Which meant that I could enjoy felting my bag (finally!) yesterday. 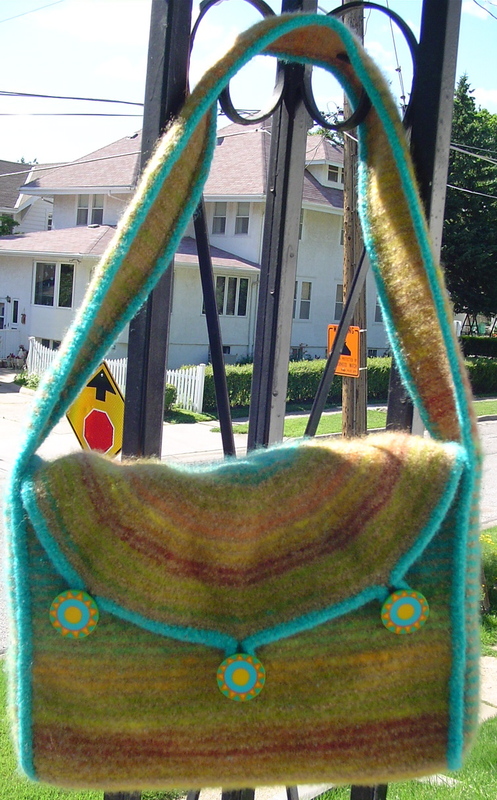 I just want to say, for the record, that I could have knit an entire sweater with the amount of yarn that went into this bag. There, I said it. The first time through the washer, I had a bag that I liked, but the handle didn’t quite felt up the way I would have liked. I believe this is because the handle wrapped around all my jeans, and prevented it from felting. I pulled it out, blocked it, realized the bag itself was bigger than expected, let it rest, then decided it wasn’t good enough. Into the washer it went again, this time in a laundry bag so that the handle would have to felt. And felt it did! The bag got a lot smaller, basically it became the size I had anticipated. And the handle really felted down! More than I would have liked, as the handle is no longer messenger bag sized, but purse sized. Ah well, live and learn! This being my first official felting experience, I am going to call it good. I blocked it with a 9×13 pan and once it seemed dry enough added the buttons I had purchased for it. Funky buttons with color tones that match the bag. Technically I am not finished with this, as I would like to add a liner, and it does need a zipper. But it is at this point useable. I loved this knit! Everything about it was fun, even the icord edging. I can actually see myself doing another. And, I’ve gotten over my felting fear, I could happily try felting again at some point. I worked very hard to finish up this 2 ply laceweight. 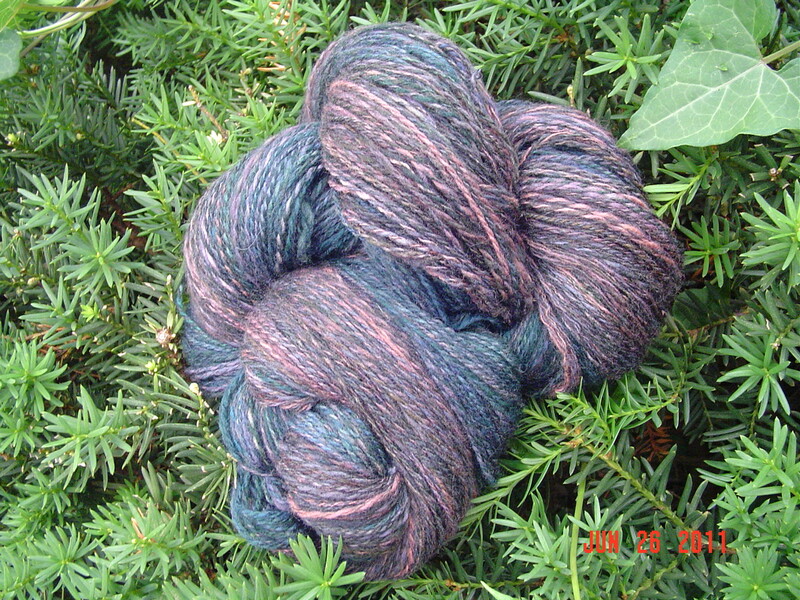 This is a gently spun merino, and I have 688 yards of it. To be frank, it isn’t my favorite even though as I was spinning it I thought it was stunning. I needed this off the wheel so I could put away the wheel until after vacation. And of course, now that the wheel is put away, all I want to do is get it out again to spin! 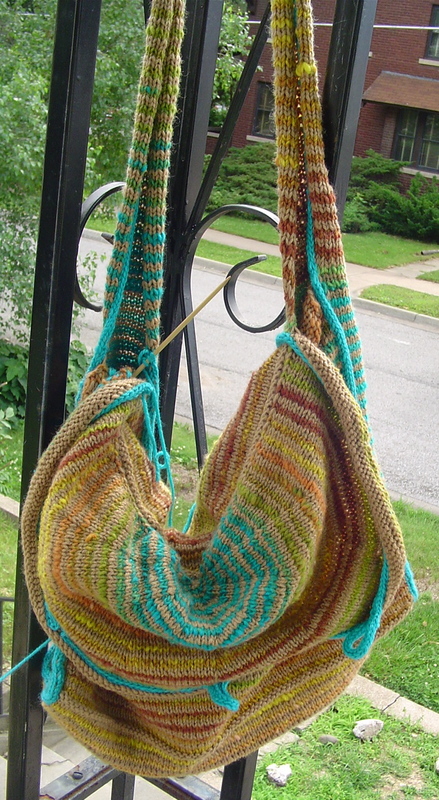 I came home last evening intending to knit on my messenger bag. The intention being the last of the icord edging, thus having it ready to felt today. But we decided on an impromptu munchkin night, and I need something easy and mindless to knit on while playing. Icord is easily the most mindless thing ever, so I set the messenger bag aside. I’ll work on that tonight. 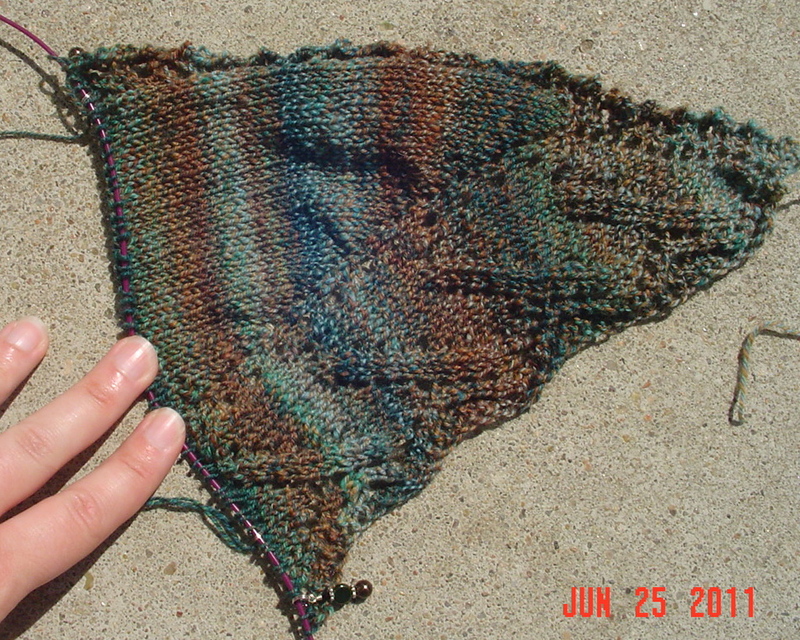 I’ve been itching to cast on a handspun shawl, and I’d seen a lovely new pattern called From Dawn ’til Dusk. It looked perfect for handspun, and lacking another project to keep me interested, I decided to cast on. The handspun is a 3 ply light fingeringweight yarn from Enchanted Knoll Farms merino colorway Sedona. I am already loving the way the colors are merging and playing. The tones on this one are completely my style! I spent today spinning, so there will be handspun to show tomorrow. Now my wheel is completely put away until after vacation, where I will embark on my fleece spinning journey during Tour de Fleece. So I am finally working on the icord edging on the messenger bag. It goes on and on and on, and yet I know I am going to love the look of it once it is complete. Like piping all around the edge. And it also seems to firm up the bag a bit which I think will be valuable, especially on the handle. I am getting awfully close to my upcoming vacation. And yet I still haven’t properly planned what I should bring to knit! I am feeling a bit out of sorts about that, but I just cannot seem to choose. I’ll probably bring a pair of socks to finish up, so that I can then leave them with mom, but those will take no time at all. I’ve got multiple projects on the needles and yet I am not sure I feel that any of them are what I’d like to knit while gone. I also don’t want to overpack either. So….I suppose I’ll have to give it more thought over the weekend.